Rare Sale. Amazon has the certified refurbished Kindle Fire HD 8.9" 4G LTE Sale: 32GB $159, 64GB $179 with special offers on sale for $159 (32GB), $179 (64GB) with Free Shipping. 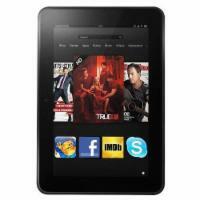 Amazon's Kindle Fire HD is a quality lower price alternative to the iPad, Microsoft Surface, and Samsung Galaxy Tablets. The tablet is great for Amazon shoppers, especially Prime members, as this tablet connects directly to Amazon services.